Do you have questions you would like to ask your local Member of Parliament? 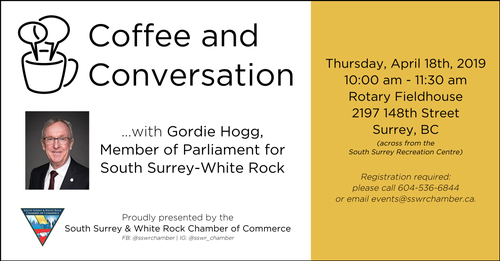 Come out for a conversation with Gordie Hogg, MP for South Surrey-White Rock. A light breakfast will be provided. This is part of a new Chamber series to give our members and the community a chance to meet with and ask questions of our elected officials.